Hurrah for the Finishing Fairie - she came, she saw, she finished! And she charged me a little money but that's okay too - if my WIP level doesn't go down my stress level will go up, so I was completely willing to trade some cash for some done-ness. This is in a box and on it's way to SWTC - hopefully they will love it and get the pattern out just as soon as I finish grading the sizes - the part I hate even more than finishing. It still doesn't have a cute name, and for those who asked, yes there are sparkles in the yarn, not randomly placed glarey bits in the camera. I know these shots are blurry but the color is close - the less blurry ones with the flash would blind you with their evil redness. 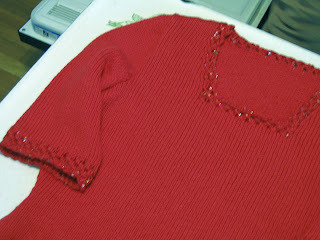 Why are red sweaters so hard to photograph? I haven't had this much problem getting nice finished photos since the Red Scarf Project last year. 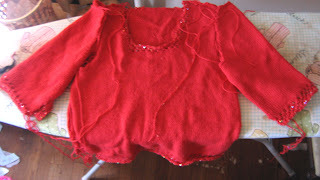 Did some felting this morning - work masquerading as fun so far as I am concerned. I probably let it go on a little too long as the finished item is smaller than I had intended, but man did I get a gorgeous, striated color run and a dense, cushy fabric. 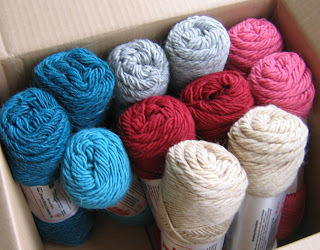 We shall see what the yarn company thinks of it when they get it - another box going out tomorrow, hurrah! Boxes and articles going out eventually = checks coming in, and I have a big old getting my basement re-finished fantasy going on. Never go to a home show if you don't have tons of cash laying around to start remodeling immediately. I stopped by a home show last weekend in the guise of doing work on the log home book (I was writing about roofs and hardwood floors and went to touch samples) and now random burly guys are trooping through the house leaving massive estimates in their wake. But if my basement was dry and mold-free, the yarn could go there. 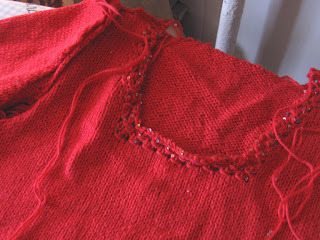 And the knitting accoutrement. And the spinning wheel. And then all of that stuff wouldn't be laying in piles throughout the rest of my house, meaning my house might actually be un-cluttered enough not to cringe every time the Kid brings someone new home to chill with. Speaking of the Kid - feis season starts this weekend and little Miss Champion starts all over again on the great trophy quest for this season. Wish us both luck! 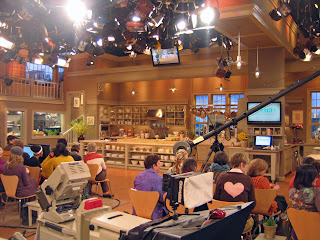 Are you ready to knit on tv? 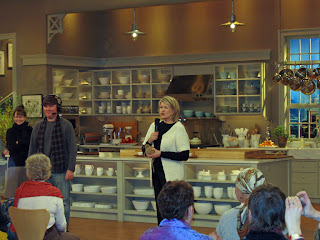 Yesterday the Kid and I went off to see the fabulous Martha Stewart! 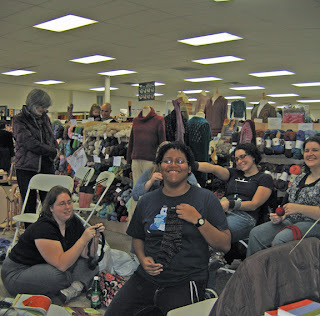 She was having a Knit and Crochet Show and asked for knitters and crocheters to sit in the audience. The show will air on Monday February 25th - you will definitely see a moment or two of the Kid in all her glory - she was the only 11 year old in the audience so the cameras came back to watch her knit a few times. She got a big kick out of a friendly camera assistant who came over to show us his working notes which had "young girl knitting" scribbled in over his seating chart of the audience. So she knew they had her eye on her, which was fun. The woman who was in charge of placing audience members in seats made sure she had an aisle in the front so she could see, which was also pretty cool. 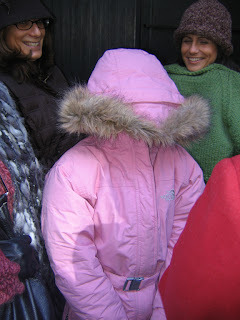 It was a little chilly, and you would think that since we were lining up for a knitwear show we would all be buried in woolies, but the Kid thought her outfit looked cuter without socks so she wasn't wearing any - and she is pretty much always cold anyway. Many nice onlookers and our friend Quirky Knitter from Ravelry helped formed a little human shield around her so we could at least keep her out of the wind! Inside was much toastier, but note the lack of socks! 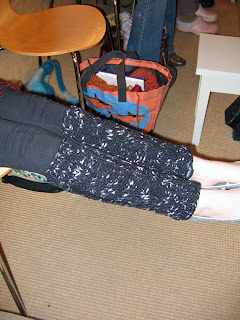 I made those cool legwarmers on Monday out of Adriafil Party that was in the stash. They look great with a cable panel up the front and a ribbed back to keep them up, but they don't photograph very well being black and silver and bulky. She had cute silver shoes on too! Thanks to my kid being adorable we had great seats, and she got some freebies too like a small cookbook and a cool water bowl for the dog. We also each got a copy of the book that was featured on the show - Sock and Glove: Creating Charming Softy Friends from Cast-Off Socks and Gloves . It is an adorable book about making stuffed animals out of commercially made socks and gloves - we may have to make one later today! Martha came out at the end to say goodbye and let all us stalker types take her photo - then she had to run off to her next appointment. Since I used to work in television I had seen many a show get made, but the Kid was amazed by all of it, and I have to say I was quite impressed with how smoothly this set ran - kudos to all. The thing I thought was most interesting was when Martha expressed surprised that we were knitting and crocheting while she was talking - I guess she didn't realize we could all multi-task! She didn't seem annoyed, just a bit taken aback. And the warm-up guy kept yelling "are you ready to knit on tv?" which was also thought was pretty funny. 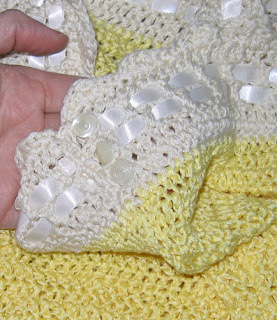 We maybe didn't knit ON tv much, but I am sure all of use had at one time or another watched a tv show and knit at the same time! Where are those finishing fairies when you need them? And I need them, really I do! 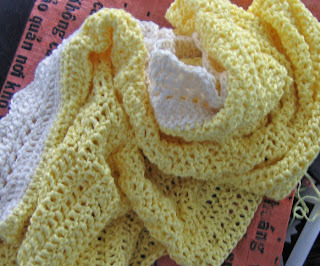 The yellow and cream crocheted top is ready for finishing - amen - and this red sweater for the lovely folks at SWTC is just needing a few seams and then it can go off to where it belongs! 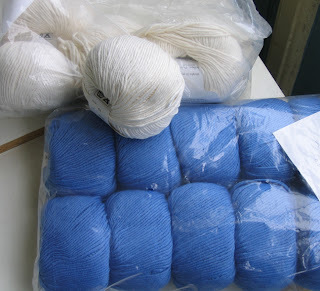 Haven't come up with a clever title yet - the yarns are Yin and Yang. a blurry WIP... This one is almost done, I intend to finish it up tonight and get it on its merry way tomorrow to the magazine that is waiting patiently for it. Yuck on the weather - we had a few inches of snow last night, followed by a dose of ice, then sleet, now rain. Eeeewwww. Gray and cold and slippery. The good news is that the Kid had a delayed opening at school today so she went in at 10 instead of 8. Since neither of us is a morning person, this actually made this morning rather pleasant. The bad news is the princess puppy does NOT like to get her paws wet, so she has been pretty much crossing her legs for the last 24 hours and refuses to go outside. She is much to ladylike to go inside where she shouldn't but she has to be uncomfortable. 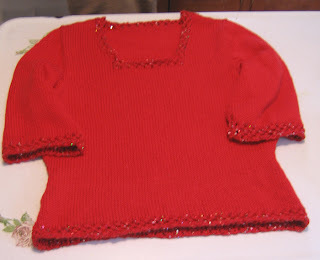 Kiddo has dance tonight (I know, it would be bigger news if she didn't have dance) and I will be crocheting the hem on that top. Also working on the never ending log home book and a long magazine article on the Model T Ford. The glamorous life, no? Um...no! WEBS! 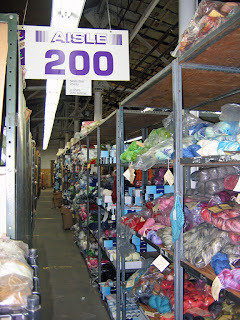 I had never been there before and was completely and absolutely overcome with faintness at the amount and variety of yarn that was all collected in one place. 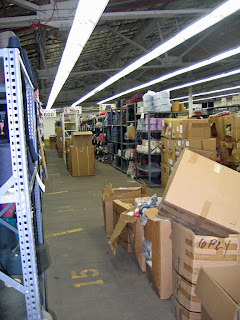 Here are a few shots of the warehouse, where the Kid and one of her local buddies spent some time running around and trying to stay out of trouble. 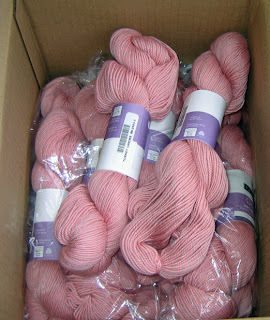 Remember how I said that I was currently living in fear of the doorbell ringing because boxes and boxes of yarn were arriving? And how normally I like boxes of yarn, but all of these had to be turned into finished projects in the next few months and I was starting to get nervous? Ding dong.... ding dong.... ding dong... ding dong.... AAAAAARRRRRGGGGGHHHHHH!